The Mixed Media Play Date Registration is NOW OPEN and I am super excited to be among the AMAZING artist instructors who will bring you awesome lessons and inspiration throughout 2019! We are all grateful for things but do you stop often enough to reflect on the everyday things? The everyday things are so important and make up our beautiful, messy, and sometimes complicated lives. Come join me and 9 other beautiful artists in November for a journey of reflection and gratitude in The Gratitude Junk Journal Workshop. I am so blessed and thankful to be a part of this class and can't wait to guide you through a lesson of gratitude. 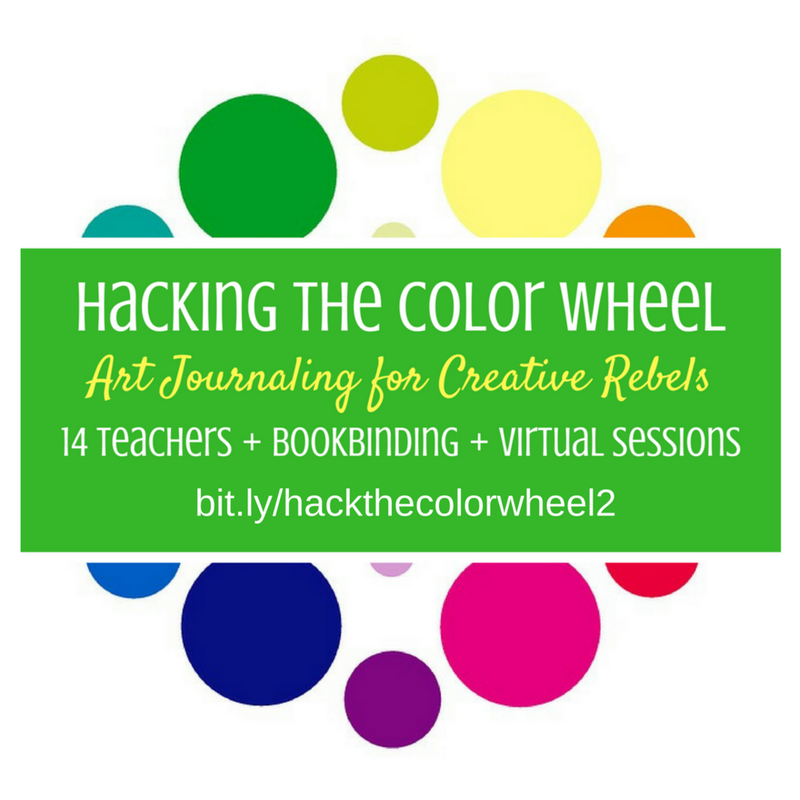 I am over the moon excited to announce I'll be teaching in Hacking The Color Wheel with 13 other talented ladies. It is hosted by Kiala Givehand and we can't wait to get crazy with color! I'll be teaching in Session 2 but I do hope you will take advantage of the full class! Both sessions are going to be amazing! In these courses we will focus on how to use colors in a variety of ways. From color wheels and swatches, to mono-color studies, color mixing, and crazy color combinations, these classes are all about how we can use color to create a feeling, a mood, and/or a story about our past, our present and our future. You guys know I love creating flowers in my art journals. They are just such a happy subject and put a smile on your face!I am super excited to announce I have a new class at Big Picture Classes and it's all about playing with flowers in an altered book art journal. 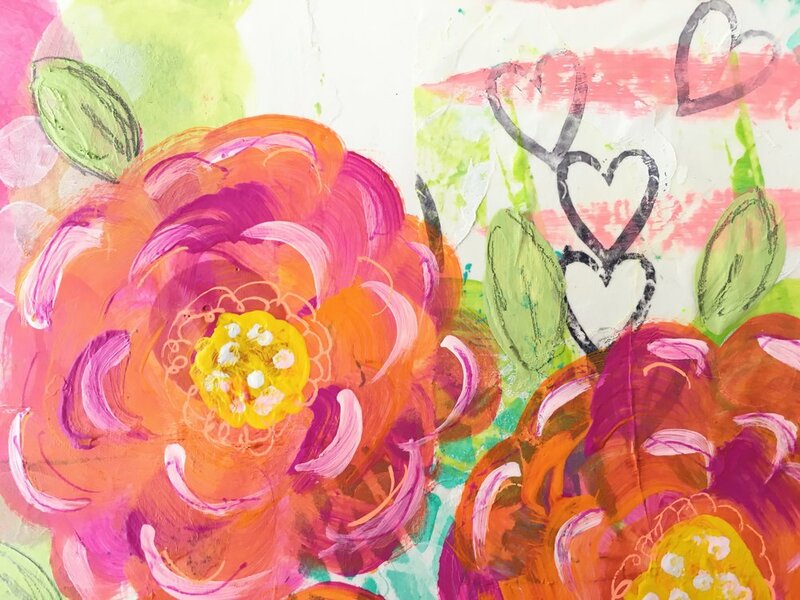 Come join me in Altered Book Flower Fun as we have fun playing and getting messy with paint, ink, pens and more. It's really all about playing and just having fun! I hope to see you in class! One of the reasons I started this little online creative space was to encourage others to make time for creativity. I truly believe everyone is creative! My first self hosted workshop that went live in November was a great leap towards that goal of inspiring others. Thank you to all the sweet peeps that have purchased my workshop so far and trusted me to lead you in a creative journey. I have been blown away by all the wonderful Artsy Doris you have created! And for a short time (through tomorrow 6/21) the Artsy Dori Workshop is on sale! You can find all the details right here that includes a preview video. Keep creating everyone! It's a beautiful thing! Do you sometimes struggle with getting past the blank page? I know I do. For the longest time I thought it was just me. But I now know all artists struggle with the blank canvas at times. One way I get past the blank page is to just start adding color. 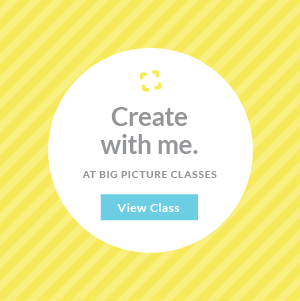 I have multiple techniques that I use to accomplish this but I am super excited to show you a fun and easy way to do this as a contributing teacher to the Just Add Color class at Big Picture Classes! This is a wonderful class taught by Jasmine Jones and Wilna Furstenberg and 15 other talented contributors (and me). I had so much fun creating my lesson for Just Add Color. Class starts tomorrow and I can't wait to see all the wonderful color ideas. I hope to see you in class! Where do you get your creative inspiration? Are you inspired by other artists? A trip to the fabric store? Pinterest? The list can be endless and we all get inspiration from different places. I find myself being inspired by nature a lot! Come join me for my March lesson next week in The Journey Within. I am so excited about the upcoming lesson! The Journey Within is a year long workshop hosted by Kiala Givehand that includes some amazing artists which I'm still pinching myself that I'm rubbing elbows with them. It's a lesson on Taking Cues From Nature. It's a lesson that comes from my heart and I talk about how nature inspired me to create this art journal page and how I work intuitively in my art journal. This is a video lesson and I show you multiple techniques that I use on a regular basis to create my art journal pages. It's not to late to join The Journey Within. You have plenty of time to be inspired by all the wonderful lessons. I hope you will come and join the fun! 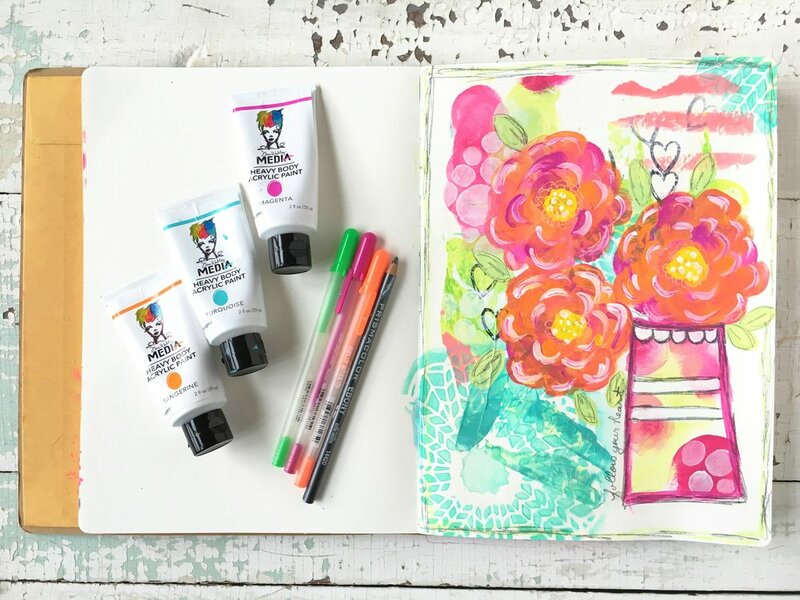 An Amazing Art Journaling Journey Starting Soon! It's almost here and I can't wait! I am so excited and honored to be a core artist in The Journey Within - A Year of Handmade Art Journals with Kiala Givehand. Just look at this lineup of artists! What? That's what I said to myself when Kiala invited me to join this group of beyond amazing women! BEYOND AMAZING! I'm still pinching myself! I'm honored to be among this group of truly beautiful creative women! 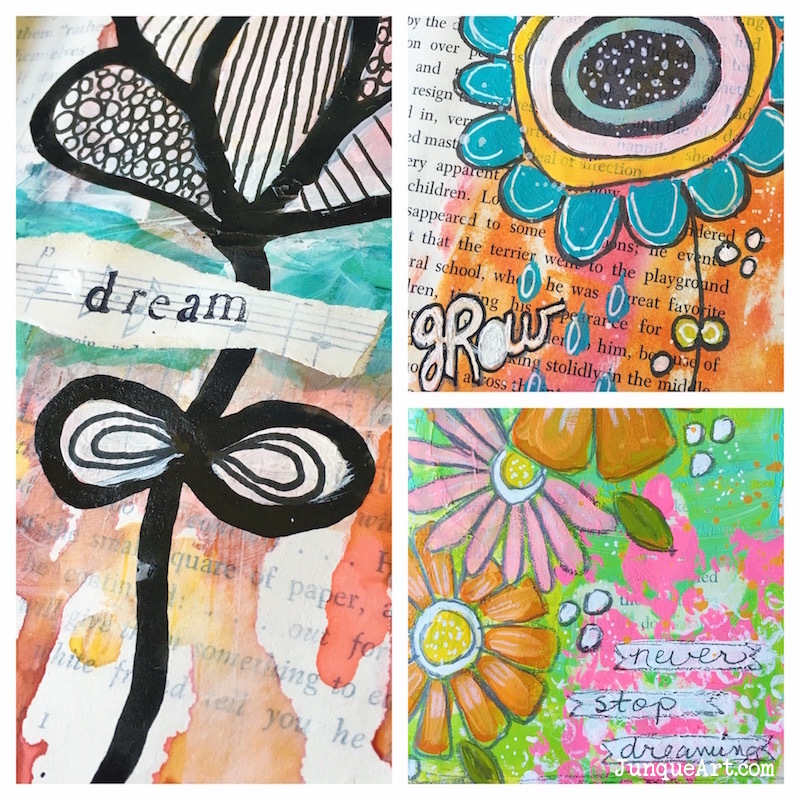 I hope you will consider joining me on this amazing journey in 2016 where we will learn how to make 12 different handmade art journals, learn mixed media art techniques, explore our creative hearts, and more! Believe me these talented women have some amazing things in store for 2016. I can't wait to learn from all these wonderful artists. The class is going to be jam packed with so much inspiration each month. And if you bring a friend along on the journey there is agenerous friend discount! How cool is that? And it's always more fun to go on a journey with a friend! It starts in just a few weeks, so I hope to see you there! P.S. I'm still pinching myself! Come On An Art Journal Journey With Me! How would you like to go on an amazing creative journey with me in 2016? I would love for you to come along! I am tickled pink and honored to be a teacher in The Journey Within: A Year of Handmade Art Journals with book maker, Kiala Givehand and 16 other amazing artists. The class starts on January 1st and goes for the entire year. I believe it is so important to make time for creativity. So for this challenge watch my Fast Forward Art Play #3 from my blog post, Just Create. Pick two techniques that I show and use in any way you want. Focus your page around the word Journey to kick off this wonderful Journey Within. I encourage you to try the challenge I gave Kiala and leave a comment with a link to your art so I can see your awesome work! Make sure you check out each wonderful artist in the December Blog Hop challenge. They have got some great challenges for Kiala for the month of December before class begins in January. I hope you will join us on this JOURNEY! It is going to be so much fun! Are you ready to get your days planned out with a flexible and unique fauxdori notebook? Do you just need a way to organize your thoughts, doodles, or sketches? Are you looking for a fun and creative way to contain your written journals or art journals? Do you want to make a unique gift for the holidays? Or do you just need an excuse to make time to be creative? Then Artsy Dori™ is for you. In this self-paced mixed media class you will have a blast making a creative and unique midori style traveler’s notebook Junque Art style. The class is open! To get all the details head over to my new classroom, Junque Art Studio, and check it out. I have been doing something creative for as long as I can remember. Through the years I discovered I loved sharing my creative passion with others. I have taught multiple classes in person over the years and I love helping others discover their creative hearts. I also love seeing the joy that they find in creating something with their own two hands. Being a part of that is something so special! That is why I am super excited about my new online classroom that will be opening it's doors in just a few days with a new art journaling class. The classroom has been a dream of mine for quite awhile and to be honest I wasn't sure it was going to happen. Those crazy voices kept coming up, you know the ones? Or are they just in my head? Well anyway, the ones in my head went something like this... "Hey, why do you think you can do this?" "You are too dang old to start a new dream." "Who the heck do you think will even take a class from you?" Those annoying voices went on and on for awhile, well for years really. But one day last year those voices started to quieten when I stumbled upon Creative Live, and just by chance discovered a really smart gal teaching a great class that day. As I continued to listen to her teaching, I started thinking differently and believing that maybe following my dream was possible. Maybe those voices in my head were just that...in my head. Who knew marketing could be creative & fun? That gal was April Bowles-Olin of Blacksburgbelle and she was actually teaching a creative business class. Wow, who knew marketing could be creative and fun and make sense? Along with those crazy voices in my head, marketing had been one of the other big things holding me back for so long. I had no idea how I would even begin to get my creative business in front of people. Now don't get me wrong, I love business stuff but marketing was one of those things that felt yucky and scary and something I wasn't sure I could do. I would have rather done 50 loads of my kids stinky sports laundry instead of market my own business. I certainly wasn't a sales person and didn't want to be. As I listened to April that day, I realized the only way I could even begin to make my dream of sharing my creative passion with others, and owning a creative business come true was to just start putting myself out there. And that meant figuring out how to market my business. So I promised myself that day I would just start and you know what? I did. I started putting one foot in front of the other and just taking it day by day in between loads of laundry, picking up kids from school, running errands, going to kids' sporting events, paying bills, and well you get the idea. I knew it would take some time. Creating the art was the easy and fun part, but all the technical things like creating a new website, figuring out how to video classes, tackling social media, and things I hadn't even thought about was going to be a challenge. But I decided I was up for the challenge so I began the journey of following my dream. Just short of a year later I have made some really great progress and have done most everything myself with some help from great online savvy biz friends. It hasn't happened overnight that's for sure, but that's ok because I'm enjoying the journey and the learning process. April makes marketing make sense for creative peeps. I still have not mastered the marketing part of my creative business and I still struggle with feeling uncomfortable getting my business in front of people. That's where April comes back into the picture. She is doing a brand new Creative Live class that starts September 29th. Being a creative herself, April has this way of asking the right questions about your business, pin pointing what you are struggling with, and coming up with great ideas to make marketing make sense for the creative peeps. I am so excited about her new class and what's even more exciting is I will be learning from her first hand in the Creative Live audience. What? Yep you heard me right, I jumped out of my comfortable little art room and landed right in the live audience. I think I might have had too much coffee on the day I hit the "I want to be in the live studio audience" button. Even though I'm shaking in my boots, I know it's going to be a great experience and I can't wait to share it with you. I'll be sharing on Instagram and maybe even Periscope if I can. April is one of my favorite creative business teachers and the live audience is going to be full of some great smart, creative gals that will make the class even more special. So I hope you will join me on this scary but awesome creative biz adventure! I might even wear something other than my kid's school spirit shirts and jeans and do my hair. Now you know it's getting pretty darn special if I'm getting out of my "Mom uniform". You are welcome April and Creative Live. Here's how to join the fun. Keep reading to see how you can get in on the creative marketing fun and watch this awesome class for free! Yep, free. High fives, wildflowers, wine samples. Who doesn’t love free? I hope you will join us online for class. And if you do, could you please send me a virtual hug so I don't pass out from fear? That would not be pretty. Thanks in advance, you are the best!